Collaboration is the new normal in the workplace. No longer are employees expected to work cut off from one another, but instead are needed to work more closely together. Collaboration means improved efficiency and increased productivity, but only if you have the right tools for collaboration in the first place. These should be expected to be based on a platform for communications, accessible not just from a desktop computer but also mobile devices, such as cell phones. This way all employees can keep in contact all the time. But communications isn't enough with good organization to allow different people to better understand others in their departments, and also those in other departments. Even better, deadlines, task managements, and support should all be built into communications. Above all, everything should be clear, easy to understand, simply to use and reduce misunderstanding. Every employee should be empowered to be able to speak to the right person, wherever they are in the company, to address the same problem. And then solve that problem within an acceptable workflow. The days of collaborative working are here, when a business can truly become a team of employees-all all of them unique individuals with their own strengths, that you can bring together for a better working environment, and a better-running business. Slack is without doubt a mighty collaboration tool, with millions of users around the globe. It’s an incredibly smart platform, and you can get it on mobile and desktop devices. It allows for the sending of direct messages (DMs) and files to a single person or a group of employees, and there’s the ability to organise conversations into different channels (perhaps for specific projects, one for technical support, general chat, and so forth). You can organise all your projects in a list or board format, and there’s a search function so you can locate past work quickly. 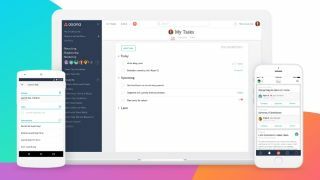 In short, Asana is a very effective way to stay super-organised and facilitate conversations when it comes to updates on how work is progressing. Podio describes itself as a flexible and customisable online platform for work and communication among teams. In other words, it gives you a way to organise large stacks of work and to delegate tasks between employees. Ryver is similar to Slack, aiming to give your organisation a highly effective means of communication, and an easy way to talk over tasks, ensuring that deadlines are met. What makes Ryver a compelling option is the fact that you can create as many teams as you want within the app, and easily categorise them to boot. As is the case with Slack, you can use the platform to set up chats with groups and individuals. There are some interesting filters, too. You can control who sees the things you say and post in the app, and obviously enough, join the teams that are most relevant to you. All company posts are located within a Facebook-style newsfeed, and you can mark posts to come back to them later on. There’s also a host of native clients across mobile and desktop, including Mac and Linux. Pricing begins at $49 per user per month for up to 12 users, and costs $99 per user per month for unlimited users. There's also a premium version for enterprise which offers workflow automation, Single Sign-On (SSO), and advanced team management. If you have ever looked into project management software and online collaboration tools, then no doubt you’ve come across Trello. Available on the web and with mobile apps, it lets you easily organise projects and work on them with colleagues. The platform allows you to work with boards or lists, which can be organised by teams and different tasks. And within these, you can set up to-do lists and delegate amongst colleagues. There’s also the option to assign comments to cards – a quick way to give feedback to others. Pricing for the Premium pricing tier is $9.99 per user per month, when charged annually, and unlocks a number of additional administrative features for better organisation. There's also an Enterprise edition which is priced according to the number of users required, and provides some additional organizational management features.